While we won’t go into detail around these specific codes in this article, we will discuss basic maintenance requirements that every facility needs to know. For more information around your facility specific requirements, please refer back to your local code authority. Manufacturers for emergency lighting inverters are required to meet Underwriters Laboratories UL924 standards. These standards ensure that the system is designed to meet the rigorous requirements set by life safety code. UL tests and certifies exit signs, emergency lights, and combo emergency exit signs to meet functionality, reliability, and visibility standards. It is imperative that these systems are regularly tested and maintained so that in the event of a power failure emergency, lights will operate and allow for an illuminated means of egress for people in the building. 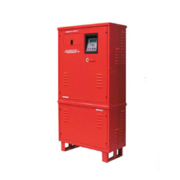 Monthly – NFPA 101 requires that a functional test be completed every 30 days. This requires a minimum discharge of 30 seconds to ensure functionality of the inverter. It is a great time to visually inspect the system and ensure that the unit is not in alarm, that there are no obvious concerns and the area is clean and free of debris. You should also conduct a visual inspection of all batteries and components within your lighting inverter. Ensure that you keep a log of your inspections readily available for a building inspector to access. Some systems will perform an automatic self-test. Under certain conditions, the NFPA will allow a computer based, self-diagnostic to be completed in place of the manual 30 second discharge, however, a visual inspection may still be required. Annually – this test involves much more individual attention and may need to be done after business hours when the building is mostly empty. AC power must be interrupted for at least 90 minutes, simulating the UL-prescribed duration and involves a close visual inspection of the unit. UL 924 follows the International Building Commissions (IBC) guidelines for tracking scheduled and preventative maintenance performed on all emergency lights, exit signs and equipment. Since employees will change over the years, having a dedicated log book showing the last inspection and who performed it is a must. In multi-story facilities, these signs and luminaries will often be stamped with a letter/number code to quickly identify each individual unit. Just like other emergency power systems like UPS systems or generators, Batteries are at the heart of every UL924 Central Inverter/ UPS System and they are also the cause of most preventable failures. Make sure that you have a competent service partner that can ensure that you have accurate testing, as well as proactive replacements. When replacements are required, most end users, facilities personnel and even some service personnel don’t know that the replacement batteries must be also be appropriate for use in that particular emergency lighting system. UL924 Emergency lighting inverters are design to keep us safe in the event of an emergency. As a facility professional, it is important to ensure that the systems that you are responsible for function when the lights go out. For battery replacement, maintenance or other questions regarding emergency lighting inverters – contact QPS today.